For this trip, my friend Riley and I headed to a fishing derby that was open from 6:00-11:00 A.M. Neither one of us had fished a derby or tournament on the ice, but this one sounded like fun. First place wouldn’t be awarded to the biggest bag, instead they picked a weight before the derby and whoever came closest to it would win. Without having a clue where they would set the weight at, we decided to get shiners and chase some flags. After getting our tip-ups set out, we got back in the shanty and started fishing for Bluegill. We didn’t know how the Bass fishing would go, so we took advantage of the morning bite and caught our limit of Bluegill first. It took about an hour for our first flag to go up, and Riley hooked into our first Bass. Our total weight wasn’t even close to what they picked to win, but it was fun to watch as everyone brought in their fish. It was a very family friendly event with kids making up close to half of the field. I can honestly say this was the first time I have targeted Bass through the ice. 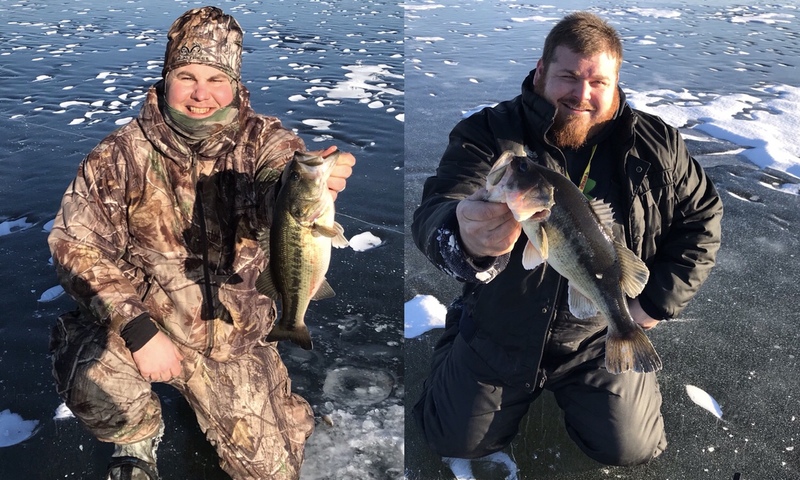 Bass fishing and tournaments are nothing new to me but after spending a day dropping shiners through the ice, I think it is something almost any kid would enjoy.